This week: Formula One's Power Triangle. Gordon Murray, arguably the most free-thinking of all car designers, built his Formula One career upon a single foundation: the strength of triangles. All cars designed and built by Murray for his boss Bernie Ecclestone, then owner of Brabham, relied upon three-sided monocoques with flat floors and tapering upper surfaces. In 1974, shortly after Ecclestone won his first Grand Prix as constructor - at, fittingly, South African Murray's home track of Kyalami - Durban-born Murray, whose Brabham designs won 22 Grands Prix, plus two Drivers' and a Constructors' Championship, elaborated on the logic behind his chosen chassis architecture. All geometric shapes apart from triangles, he said, deformed at their weakest points - normally their corners - when pressured, whether internally or externally. Changing their corner angles simply converted them to parallelograms without any side dimension changing, whilst circles became lozenges without circumferences necessarily altering. Triangles, though, were different, Murray continued. Their angles, and thus geometric shapes, could not be altered without at least two dimensional changes. Triangles, concluded the man who went to oversee McLaren-Honda's record-setting MP4/4, provided engineers with the greatest torsional rigidity of all shapes, and were, thus, ideally suited to chassis design. It should come as no surprise, therefore, that Bernie Ecclestone has applied triangular theory to the tripartite Concorde Agreement which binds the sport's controlling body, the FIA; Ecclestone's SLEC group - even if 75% is now shared between a provincial government and a mutual savings fund - which incorporates Formula One Holdings; and, at present, ten signatory teams. Seen schematically, the relationship between the three parties is best illustrated as a triangle, with the FIA at the top corner, and the teams and SLEC on each of the bottom corners. with the FIA, as owners of the formula, obviously occupying the pinnacle; Ecclestone figuratively sitting to their right, with the teams collectively sitting to the left. As can be seen, the included angles of each of the three corners are equal, as are the dimensions of each flank. Each party may (will?) argue that they deserve the acutest corners or longest flanks, but, in real terms, Formula One cannot exist without a positive triangular interface between the sport's primary role players. There exist suspicions that the FIA and SLEC are closer together than illustrated, that the angle separating (joining?) them runs at 45Â° or even less, resulting in shorter 'flank' for the teams, but it remains in Formula One's best interests for all parties to co-exist as equals, for the more equal these relationships, the more stable the sport. With, though, Concorde's present terms and conditions expiring at end-2007, plus the stratospheric amounts at stake, each of the three sides is stretching the triangle. To paraphrase Murray, no dimension can change without at least one other facet of the triangle altering in tandem. And, hence, the sport's present instability. In short, the triangle's torsional rigidity is being sorely tested. 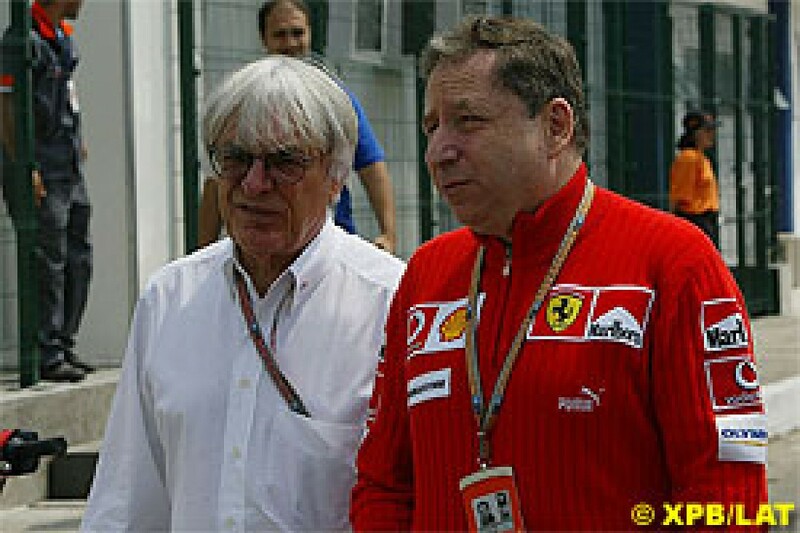 The ante was seriously upped by the capitulation of Ferrari into Ecclestone's camp. The Italian team had been a founder member of GPWC - now effectively Grand Prix Manufacturers' Association - and their defection to the 'enemy' was a major blow for the teams. Then Red Bull, known to be on more than mere nodding terms with FIA President Max Mosley, subscribed to Ecclestone's vision for Formula One, followed shortly thereafter by a Jordan more cash-strapped than even Minardi. That team, having been bought by Red Bull for conversion into a rookie team, is expected to drop into Ecclestone's camp within a week or three, whilst Williams are known to be sitting on the fence. All this has been well-documented within these pages and elsewhere, and provided merely as background. Banning of tyre heaters/warmers, bringing the FIA's recent safety campaigns into sharp question given a need for heated tyres on 'out' laps in racing conditions. In fairness, the FIA did add "(only if) no objections on justifiable safety grounds (from tyre companies)". But, in that case, why not ask a few questions first? Spare cars to be banned entirely, which could seriously impact upon impressions gained by potential sponsors, who, expecting to be given full pit tours on race day morning, discover that all cars are lodged in Parc Ferme. The banning of third cars on Fridays, which is a total about face, given that they were initially encouraged by the FIA as a means of aiding strugglers. To criticize teams for "gain(ing) a competitive advantage" through their use is strange: what, after all, do race teams exist for if not to gain a competitive advantage? Reducing the number of people working on each car during a pitstop, with only one technician per wheel per tyre change. The effects can be easily quantified by analyzing A1 GP's almost comical pitstops. A 14% reduction in practice time - from 3.5 hours to three hours, which would seriously impact upon smaller teams with less sophisticated simulation systems. A knock-out qualifying system, which, compared to the present 'hot lap' process, could discriminate against smaller (slower) runners by removing guaranteed television opportunities. Rescheduling of the Drivers' Parade to shortly before the start of the race, which, at venues with zero sideshows - and there exist more than a few - would leave spectators paying up to $400 for a race ticket, with zero activity until 13:30. 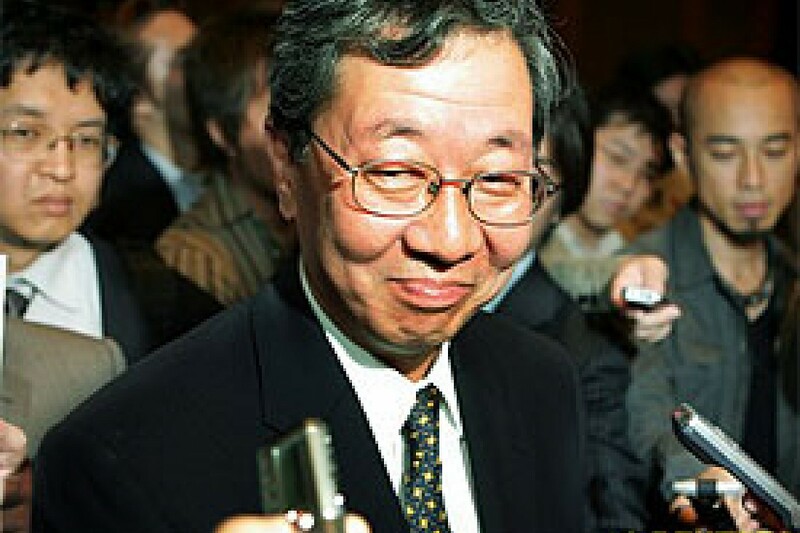 At a time when Honda is completing the purchase of BAR, which will cost the Japanese giant upwards of $250m, at a time when Honda has admitted to 'supporting' - which, in F1-speak, equates to whole or partial funding - the concept of a second team; at a time when Toyota is building a second wind tunnel valued $75m; at a time when Red Bull has bought a second team - estimated cost $40m; at a time when BMW is committed to spending mega-millions on the restructuring of Sauber - bought in June at an estimated $100m, why are these 'cost-saving' proposals being introduced if not to further alienate a leg of the triangle? Put differently, could the primary motivation behind these so-called cost-saving proposals - which, according to McLaren boss Ron Dennis will have exactly the opposite effect- be to make Formula One more affordable for Ferrari, said to be struggling financially and blatantly battling on the performance front, and big-spending Red Bull, to whom Formula One is nothing other than a massive, if seemingly well-structured, marketing campaign? And, if not, previous perceptions that the FIA favours these two operations are certainly reinforced, much to the chagrin of teams not aligned with the new, as yet undefined, Concorde Agreement. All these proposals need to be voted for by the FIA's F1 Commission, which, rather mysteriously, has not met for over a year. In fact, it was in the wake of that last meeting, held on 28 June last year, that Mosley "resigned" his presidency "in order to lie down on a beach with a good book", with a follow-up meeting in mid-December - at which control tyres and restrictions on testing would most likely have been voted in against the then-wishes of Ferrari - being cancelled at the last minute by the FIA. Exactly why the cancellation occurred, though, is not clear. Whatever, 23 voices - 25 when 12 teams are committed to the Championship - made up by those of Mosley, Ecclestone, ten team owners, plus representatives representing the interests of engine suppliers, circuit owners, sponsors and tyre companies, will vote on these proposals at a Commission meeting on 24 October - just two days before a World Council Meeting and three days before the General Assembly meets to elect a president for another four-year term. If, though, the Commission fails to reach agreement, the alternative is simple: in terms of Concorde, all rule changes voted for after 1 November require unanimous agreement, which, as recent events have proven, will be virtually impossible to achieve. 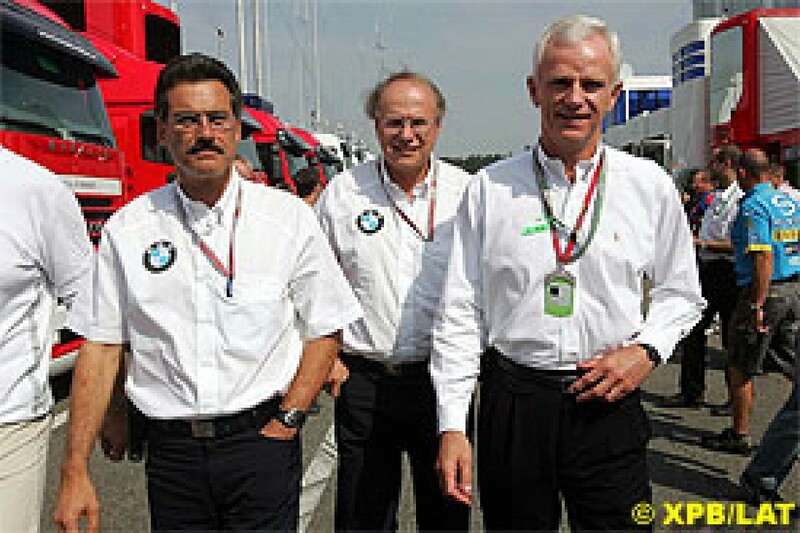 Almost simultaneous with the release of the FIA's latest proposals, the GPMA, via Bayerische Motoren Werke's Burkhard Goeschel, attacked Ecclestone and Mosley and urged them to listen to GPMA demands - for greater regulatory transparency and more equitable revenue sharing - or risk the demise of Formula One. Speaking to Reuters about the GPMA's threats to start a rebel series, the BMW Executive Board member said, "We have nearly reached the point of no-return, the contracts with circuits and sponsors is a two-year approach. The decision should happen within this year." Then, in an interview with a German newspaper two days later, he added: "We are firm about making the top level of motorsport transparent, and the current Formula One is not (those things). We want a clear corporate management and control (structure), an independent jurisdiction and equitable distribution of profits." He followed up rather harsh calls for reform from Ecclestone, and accused the FIA of not concentrating solely upon being the sport's authority charged with supervising the fairness of motorsport. "Today the FIA wants to be the technical and sporting law giver, judge and police officer, all rolled in one body." BMW is a German company, but any student of German history knows full well that Bavaria considers itself more than a province of Germany; most Bavarians consider the Freistaat Bayern to be a landlocked principality, complete with own prince. The northern provincial border is, to many, the Weisswurst Equator, with land surface to the north belonging to Germany, and that to the south being true blue Bavaria. And, when BMW, as jewel in Bavaria's crown, sneezes, the state rapidly feels chilly. This Free State Bavaria happens to hold a 50% share in the Bayerische Landesbank, aka Bayerische LB or BLB, courtesy of a rather myopic loan made to another Bavarian, a certain Leo Kirch, to finance on behalf of his eponymous group the purchase of, ultimately, 75% of SLEC. When Kirch was eventually liquidated, BLB found themselves holding 47% of SLEC, with JP Morgan and Lehman Bros holding the combined balance, leaving Ecclestone with 25% and a belief that he controlled the lot. Numerous high court cases later, the banks were granted controlling rights, and, last week, after publication of a clearance decree by the European Union Merger Regulation, BLB obtained sole control of Jersey-registered Speed Investments Ltd - the vehicle formed by the trio of banks to administer their 'investment' in SLEC. In the past, matters were relatively easy for Ecclestone, for true to banker form, disagreements between the bankers, who were reluctant of a $1,6bn share in a global sporting business they knew zero about, were said to be regular. Thus, on the few necessary occasions, he could appeal to one or the other for support, play off one against the other if the need arose. Since last Friday, though, things have tightened dramatically. Whilst the manufacturer group have long and oft said they have no intention of purchasing shares in SLEC - which premium butcher purchases goodwill in an eatery to which he supplies meat, when he can just as easily establish an opposition restaurant? - the group may just find that Bavarian state-owned interests within BLB edge closer to the province's largest company, and, by extension, GPMA. And, being a two-way street, BLB may just find BMW - on behalf of GPMA, of course - requesting certain 'favours' not unrelated to SLEC. It may just come to pass that BLB instructs Ecclestone to change his modus operandi, particularly if the manufacturer threat mutates into a serious challenge to the detriment of BLB's holdings in Formula One. And who would be best placed to advise BLB on the threat? Why, BMW, of course. Friday's EU clearance was significant in that it signaled the removal from the Formula One triangle of two of three banks, but its significance increased 10-fold with news that BLB became the sole banking entity remaining in partnership with Ecclestone, and, thus, by loose extension, the FIA. Had, for example JP Morgan, purchased the shares held by Lehman and BLB, the news would have remained significant, though with diluted effect. The strength of this triangle has so far contained the pressure, but it sure is straining at the seams. Possibly Ecclestone requires Gordon Murray, whose final Brabham Championship - in 1983 - was delivered by an extremely sharp looking BT53 powered by a turbocharged BMW engine, more than ever before.